(Masters of the Court, 1). 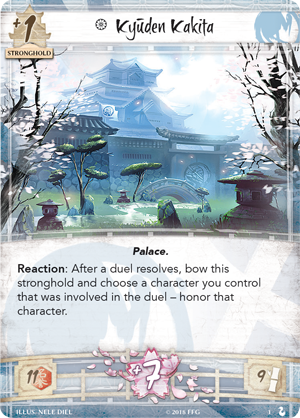 Melding the themes of dueling and honoring characters, Kyūden Kakita can be used to honor a participant in a duel. 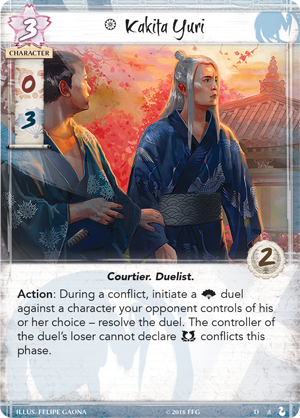 With an increased emphasis on dueling in both Masters of the Court and the Children of the Empire Premium Expansion, winning duels already provides a variety of rewards. 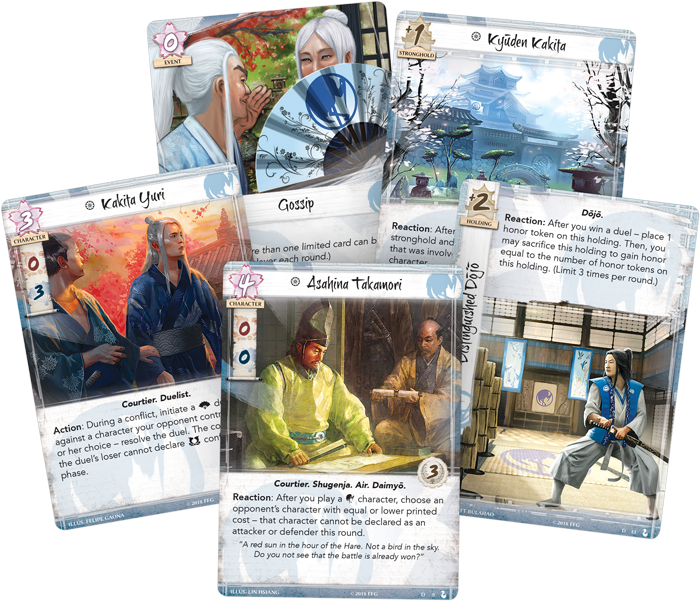 (Core Set, 146) or Kyūden Kakita, he becomes nearly unbeatable. (Masters of the Court, 13). The Crane are one of the most honorable clans in the Emerald Empire, and victory only brings greater glory. After you win a duel with the Distinguished Dōjō on the field, you may place an honor token on it. Then, you may sacrifice the Dōjō to gain honor equal to the number of tokens on the holding! 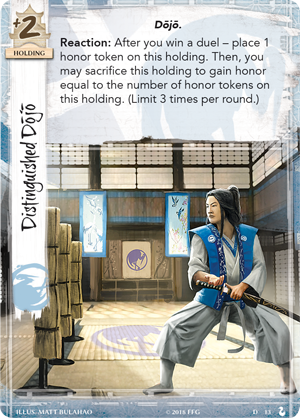 By accumulating up to three honor per round, the Distinguished Dōjō can provide you with a massive influx of honor that can be used for bidding on card draw or duels, or perhaps even used to ascend to an honor victory. 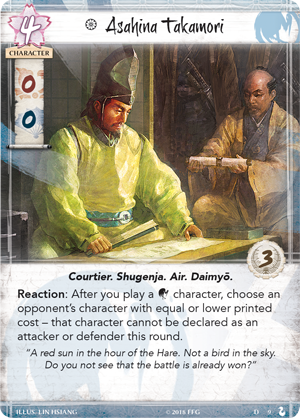 (Masters of the Court, 9) is the Daimyō of the Asahina family, and although he has base stats of zero, his ability can completely change the momentum of the game—after you play a Crane character, you may choose an opponent’s character with equal or lower cost and prevent them from being declared as an attacker or defender this round. 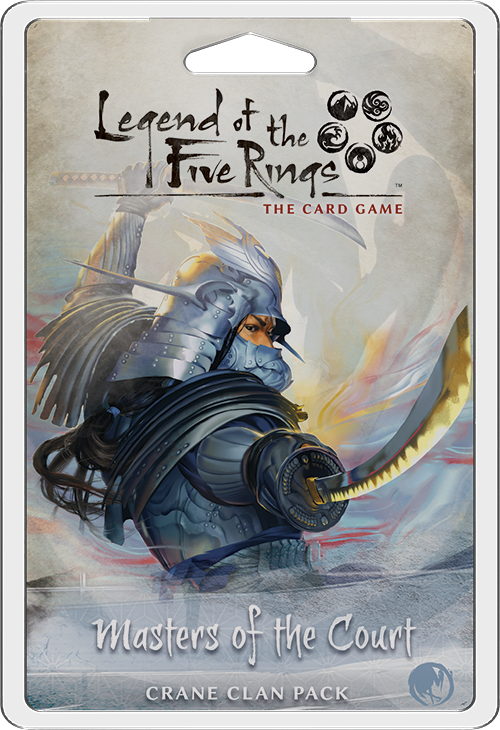 Essentially, as long as he remains on the field, Asahina Takamori can continually neutralize threats on your opponent’s side of the board, keeping fate trickling off of these characters as they remain stagnant. What’s more, if you manage to honor Asahina Takamori, he can even start to contribute to conflicts himself with three military and three political skill. (Core Set, 202), this attachment is an ideal way to shut down powerful characters, and at only one influence, it’s sure to show up in plenty of conflict decks. (Masters of the Court, 16), a Lion Clan Bushi who specializes in removing Courtiers from the field. 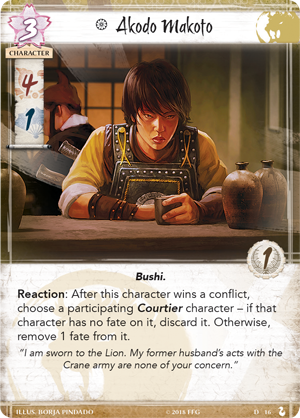 After Akodo Makoto wins a conflict, you can choose a participating Courtier and discard it if it has no fate, or remove one fate from it. 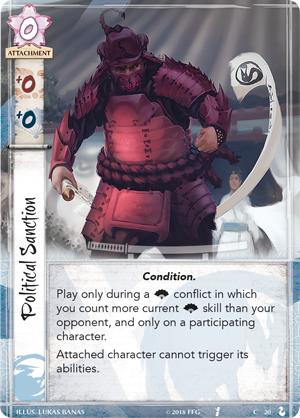 Of course, this can be devastating to clans like the Crane and Scorpion, who rely on Courtiers to achieve political victory. But even if there are no valuable targets, Akodo Makoto still contributes four skill to a military conflict, making her a valuable ally to any Lion player.